HANK PHILLIPPI RYAN: It's enough to drive you crazy. Admit it, it is. You know you shouldn't read those Amzaon reviews, except, you know , the good ones are SO good, and it's reassuring and heartwarming to see someone you don't even know have such good taste in talking about your book. So of course, you read 'em. Then one day, the little number by your book cover says "40" when the day before it said "39." So you know there's a new review. And, WAAAIT a minit. Your lovely solid five * thing is now edging closer to 4 *. Huh? My worst, so far, and I'm so sorry if this is someone reading this blog but whatever, was when one review of one of my books said that the bad guy just showed up in last chapter, and no one had heard of him in the rest of the book. That 's just--gasp, it still makes my stomach clench--not true! I mean, its not true in any way, and the bag guy is there front and center from the beginning. So the person could not COULD NOT have read the book. So WHY put up something like that? Don't get me started. Today Catriona offers a new, kind of glass-half-full way of looking at reviews. You'll never read them the same way again. And that (like Catriona) is a good thing. One starrrrrrrrr, shining in the darkneeeeeeeesssssss . . . I know this song. It’s an emetically emotional power ballad. It’s made for So You Think You’ve Got Talent, You Deluded Schmuck. But I can’t remember the title, can’t find it by googling the lyric, so can’t give you a link to a YouTube video. Be grateful. At Bouchercon 2011 in St Louis this year, Colin Cotteril and I got re-acqauainted after meeting once years ago and bonded over the joys and challenges of *, the topic of the panel Colin dreamed up and moderated, to the entertain ment of all. The joy is straightforward enough. Fiction writers are interested in character and the writer of a * usually reveals a lot more about themselves than about the book they’re reviewing. The challenge is to chart a path from the universe of the special individual who wrote it back to the world where the rest of us live. Endless fun for Colin Cotteril, for me and maybe for you too. Okay, first off: let’s not talk about * for books that deserve no more. In any merit system, the best books belong at one end and the worst at the other. No one can dispute that. And *s that start with “I’ve been waiting five weeks and my book hasn’t arrived” are just too sad to contemplate for long. Also, only a churl would take a pop at those poor, beleaguered high-school students being made to write reviews of books their teachers chose. Reading a book is one thing; doing a book isn’t. No, I want to talk to you about the others; the delicious, moon-howlingly mad *, the *that makes you glad this reviewer doesn’t have a small country to run, the * that makes you hope this reviewer has a curfew or even an ankle-band. There are some simple algorithms to deal with the most common egregious *s.
1: * from anyone who doesnt know how to use apostrophe’s = three stars. And so, just as you can convince yourself that you have a diet so healthy that you make Michael Pollan look like Homer Simpson – because food you eat in the car, in other people’s houses, or standing up in front of the fridge doesn’t count – you can convince yourself that you have never actually had a legitimate *. Or I can anyway. If you read enough of these things, you start to see other patterns too, more subtle patterns, but they’re there. I get that a tube of Pringles should be a tube of Pringles and if you crack one open to find the best peanut brittle of your life you might still be miffed. But novels aren’t extruded product. A * Petulant Huff is a four star to me. I’ve never met a writer who wasn’t in it up to her (or his) neck, deeply involved with her characters, acutely aware that every time you publish a novel you’re cracking open your ribcage, pinning back the flesh of your chest and letting the world see, and judge, your beating heart. So a * Cynical Drawl is a four star from where I’m looking. And then there are the one-offs. The randomly hilarious reviews. They light up my day so brightly, I’d rather have them with their bonkers * than a saner five-star any day. Especially delectable is when you hit a patch of them around one innocent little book. The world’s more fun for knowing that someone reviewed How to Make an American Quilt and complained, apparently without irony, that it seemed fragmented. “Fragmented.” “Quilt.” She read over her review, saw these two words close together in the same sentence and . . . nope, nothing. “ A book about a movie.” I’m happy to be alive. Now, for budding * fans, a couple of pointers about how to find the juicy ones. Stephen King is one of my favourite writers. His fan-base has, at its far opposite edges, Group A. devotees of his earlier, horribler novels (I think of these readers (unfairly) as Comic Book Guy) who loathe his later, messier stuff and Group B. readers who love his characters and his towns and his big, warm heart and think he’s getting better and better (and kind of wish he’d do one without any BOO!, just to see what happens). So Comic Book Guy is giving King a lot of * these days. Here’s a good one of Lisey’s Story, with a smidge of Petulant Huff and a pinch of Cynical Drawl too. I can’t remember how many times I’ve written a book and given to my husband to put out under his name, can you? Well, it’s the wifely thing to do. Or you can go straight to the top. Pride and Prejudice has 55 *s on Amazon.com as I write. Half of them are complaining about the price, the quality of the CDs, the kindle edit or, in one case, the paper quality. And some of them are from poor high school kids being tortured by their teachers. But others are gems indeed. And while you’re at it, think of Romeo and Juliet as the West-Side Story of Renaissance Verona. Think of Dr Jekyll and Mr Hyde as the Nutty Professor of Victorian London. Think of Mary Shelley’s Frankenstein as the older brother of The Young Frankenstein, and pause to wonder why she wrote a book about a movie. HANK: Ah, I can't type. I am still laughing. Let's just say..we'll give a copy of Catriona's new book to one lucky commenter--and come on, who doesn't want to comment about reviews? 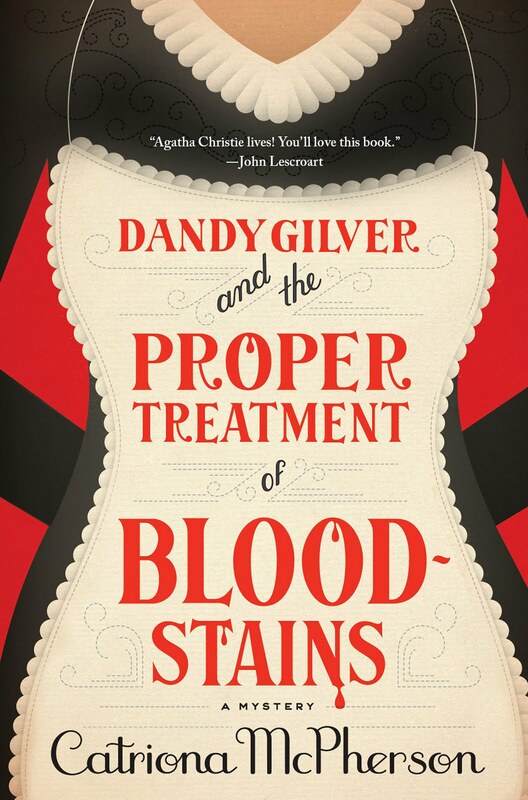 St Martin's Press have just launched the series in the US with The Proper Treatment of Bloodstains. A year ago, Catriona left a ramshackle farm in a beautiful valley in southern Scotland, and now lives on a ramshackle farm in a beautiful valley in northern California. Cantaloupe instead of rutabaga - otherwise business as usual. Check out my website https://webmail.whdh.com/owa/redir.aspx?C=a865385c47014701bcdaa604685d895a&URL=http%3a%2f%2fwww.dandygilver.com.%2f. Read my weekly blog sitting typing alone in a room. Follow me on Twitter @CatrionaMcP. In fact, good luck trying to avoid me. What fun! To wake up and laugh is a great omen for the day. I laughed out loud at your ideas on viewing * reviews, especially the Pride and Prejudice/Romeo and Juliet one. Many thanks for your post. And I loved the one about Stephen King turning his novel over to his wife. I'm going to try that today with DH--then I can go out shopping or something. With my new name, I have no reviews yet--which is kind of a pleasant state:). Thanks Hank for introducing us to the hysterical Catriona! Thank you, Catriona, for kicking me into the day laughing. It's great to have a mechanism to make sense of the senseless stuff. I especially like the * conversion for misuse of apostrophes. Thanks for the fun! Hilarious! One gold star for you! If her books are as entertaining as this, I would love to win a book. "I don't read them. If they're good, you get a fat head and you're difficult to live with. If they're bad, you get depressed and you're impossible to live with." If I recall correctly, Diary of Anne Frank got at least one terrible review on Amazon because it was "a downer." Gee. You think? It's nice to be among friends. ... I remember when a PW critic called my book a "well-intentioned Christian novel." I was incensed. I'm a Unitarian, for pete's sake! Thanks for the five star laugh, Catriona! I wasn't aware of the Dandy Gilver movies, so it's good of you to bring them to our attention by putting them in book form. Brilliant! SF author John Scalzi once put some of his one-star Amazon reviews up on his blog and challenged other writers to do the same. "However, despite the plot twists, and the continuing excellence of written prose, this book is a complete disappointment on the christian values front." Also, I just read Betsy's comment and LOL'd! Nicole! I'm stealing that line. And Betsy, that is SO funny. Can you believe the line about the apostrophes? And loser? And boring? OK, I can't help but point out (not that I ever read my bad Amazon reviews - oh, of course I do!) that you can get the off-topic reviews removed from Amazon - you know, the ones that complain about late shipping or lack of a recorded version or review, well, the wrong book. And yep, I've done this for friend's books, and those reviews disappear post-haste. (Here's the link that describes what's allowed, and link at the bottom to email.) In theory, you can get ones removed that contain spoilers, but I've yet to see that happen. Very funny take on reviews, Catriona! I do love your * = **** new math. I'm very happy that I have your new book already on my TBR pile. Looking forward to it! Love it! My own favorite one-star was "if I wanted an old library copy I would have ordered one." People say the dumbest things. I once bought ten copies of my first book at Costco (hey, royalties!) and when I checked out the checker looked at them and said: "Are you going to read all those?" Yes, over and over and over. Thanks, Catriona. Can't wait to read your book! Lise, that's too funny..well, yeah, you;re gonna see if that darn typo is in ALL of them. Sara, I didn't know that! That's definitely news you can use. Thanks..
HOw about this? I once got a five star review from a reviewer -- a professional reviewer - where I could tell she hadn't read the book. At all. I guess it was better than a one star review where the reviewer hadn't read the book. At all. But still made me wonder about the entire system. Nothing to do with reviews, but the Starry Night image: Did you see the piece on 60 Minutes on the new theory -- and book, natch -- about Van Gogh's death? That it wasn't suicide but an accidental shooting by some neighborhood kids? Fascinating! Betsy - I just inhaled some coffee. Thank you, red junglies, for your comments. I actually took Rules 4&5 of Writers' Maths (thanks, Nicole) out - I thought maybe I'd seem weird if I admitted to them. Here they are. And Sara - I've now got my new career: services to Jane - getting sll the kindle grumbles out of P&P's star-rating. . . . (thinks) . . . should maybe start with living writers/less obvious no-brainers. Well put. I have a woman who hates my US Grant series because I don't write the Grant that she imagines him to be. She gives one star to any book involving Grant that does not agree with her view (which is pretty much everyone including a Pulitzer winning bio of Grant.) But it still stings. What I don't understand are the praising reviews that only give 3 or 4 stars. Where in Northern Cal are you? We might be neighbors. What a delight to finally see reviews of reviews! I seldom read any book reviews, preferring to find out for myself. Amazon reviews? Just plain absurd. But great thanks, Hank and Catriona, for today's hilarious trip through *s.
Yeah, Jeffrey, someone gave PRIME TIME a STELLAR review yesterday, just glowing, fabulous--then gave it four stars. As for the US Grant thing--that's so head-shakingly sad. Oh my, it almost msakes me wish for * (well, no). But I'd love to meet the person who complains that someone wrote a book from the movie. Priceless! Evan Ellp us! Rhys, that's a scream. I'm near Davis. Hilarious insight into the one-star review mentality! A couple of years ago I was appalled when dozens of "reviewers" gave JR Ward's new Black Dagger Brotherhood release one star on Amazon because they were angry it wasn't available on Kindle. Such a dumb and dumber scenario! As others have said, hysterical post--thanks so much. I've got Dandie on my bedside table, queued up on my TBR pile. Can't wait. "Get back to your computer and read my mind with a bit more attention next time,"
Perfect! You're one-of-a-kind, Catriona, and as brilliant in your nonfiction as your fiction. That was wonderful! Thanks for the dose of humor in something we can take way too seriously. I'm looking forward to reading your book! Pretty sure the song is One Voice by Barry Manilow - One Voooicccceeee singing in the darkneeeesssss.... okay, I'll stop now *grin*. Wonderful perspective. I say anyone with juice enough to review a book they haven't read deserves at least a raspberry. Looking forward to reading your books, Catriona! One voice singing! I wondered why I couldn't find it. Laura and Shel, there's no shame in knowing Barry Manilow lyrics so well that you can even spot them through a disguise. I love the Review Math and your upsidedown view of the * review. And I need this Paul Newman quote next to my computer. However, if by chance I forget and actually read reviews, I will think of your humor and imagine the reviewer/characters from the movies LAURA and RATATOUILLE. Really, what can one expect from either a murderer or a cartoon in the way of a review? Thanks for all the wonderful, laughable gems in this post. I thoroughly enjoyed checking out your website today -- and I'm looking forward to discovering your books! This was the perfect day to read this. I was feeling a bit bad about getting a * that was pretty much "Aha, You're way off base and I found a few errors that made it past the proofreaders so I didn't finish reading it," then an email followed with a 5* and a big thank you for writing the book. I went from dejection to elation. Opposite ends of the pole, and this article put the whole thing in perspective for me. You defnitely have to consider the source and whether the reviewer is writing a "gotcha" review. That was great. I love your reasoning. Thanks for the laugh. Fine, fine you all. Now that song is stuck in my head. Luckily Shel is such a good singer. Catriona--are you working on another Dandy? "This book is awfull i mean one sookie story thats crap i got the book today sat down so happy to read.read the first story so happy then the other story are not about sookie i guessi made mistake so im going go drop it off half price book story ,damitt ,.i guess i guess miss sookie and eric"
How many * does that convert to? Toni...dying. YOu'd think someone who reads-- could read. Oh, my captcha word is "quabby." Maybe that's what we should call people who write those "reviews." "He's so quabby, he's an idiot." I've just taken the perfect cur for Barry Manilow lyric stickage - a kd lang concert. She was perfect, but endearingly uncool (she can't dance and doesn't let it stop her). Toni - (who can dance) - that might just take the biscuit. Hank, I'm waiting for page proofs of Dandy's next adventure - A Bothersome Number of Corpses. Hurray! And see you soon..
Oh, and PS - some folks do write their spouse's books. Not at all sure I understand why (not wanting to cross genre in one's own name?) but it happens. I'm late to this party, but my all time least favorite Amazon comments begin with, "I only read the first two chapters but, trust me, this book is terrible!" In my world, one should not be able to write a review without at least reading the entire book.